This article covers the process of creating a demo for a support request. If your request is supplied with a demo - your problem will be certainly solved in shorter time. We really want to help you but we need a demo to reproduce the issue. CSS, JS files used in your app. Test data, images and other static data used in your app. Code that contains the issue. Remember, your final demo must run on a 3rd party computer. Create a folder with the name that somehow relates to the issue (e.g. "my_demo ") in the root directory of your local web server. Create a subfolder with the name "codebase " and place source DHTMLX files and all other css/js files used in your app there. If you use data files in your app, create a subfolder with the name "data " and place the files there. If you use image files in your app, create a subfolder with the name "images " and place images there. 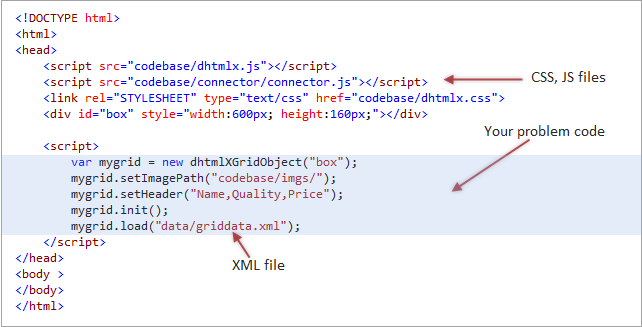 Create the "index.html " file in the "my_demo " folder and fill it in with your code that causes the problem. We really appreciate if you help us to find and solve your problem faster.